To add some sweetness and tang to these chocolates, I mixed in some goji berries which really compliments the hibiscus flavour. They also make it extra healthy! I love the satisfaction of creating your own chocolate and being able to choose the exact flavours and textures you want in it. I wanted a sweet and soft but not runny centre, which I achieved by mixing creamy cashews with chewy goji berries. Whilst the dried hibiscus creates dry specks of crispiness and crunch. Yum! I’m entering these chocolates in the We Should Cocoa challenge hosted by Elizabeth’s Kitchen Diary on behalf of Chocolate Log Blog. This month’s challenge was to create chocolates and truffles and as I had some leftover raw chocolate making ingredients from my Raw Cake Pops, I decided to try raw chocolates for the first time. I recommend trying them, even if you’re not on a raw food diet, for the taste and health benefits. Melt the cacao butter on a low heat with the honey/agave. When it’s melted, stir in the cacao powder, mix well until smooth and pour a small amount into your chocolate molds (fill about 1/4 of the way up.) Leave in the freezer to solidify. In a food processor or high powered blender, grind the cashew nuts, goji berries and hibiscus together, adding a little water if needed to create a smooth blend. Add the cacao powder, coconut flour and sweetener and blend again until a thick, sticky batter is formed. With wet hands, roll small amounts of the truffle mix into balls and place in the centre of your chocolate molds. Use the rest of the melted chocolate to pour over the truffle balls in the mold and leave in the freezer or fridge for at least 3 hours or overnight. Transfer the chocolates to mini cupcake cases and keep in the fridge for up to a week. Enjoy! These look amazing! I never would have thought to use hibiscus in a chocolate. These are absolutely gorgeous! That cookbook looks gorgeous including the raw hibiscus & goji berry chocolates! Isn't it nice to create your own chocolate with the textures and flavors you've wanted? I like mine with salty and wet tones, i.e., creamy caramel. Ooh yes, I love caramel too. If you have a vegan recipe for salted caramel I will be your best friend forever! These are superb! Stunning! This is exactly the kind of delicacy I was hoping people would make when I set the challenge theme this month. 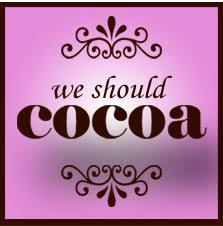 Thank you for sharing your beautiful creation with We Should Cocoa! How beautiful! And healthy too. Nice job.